Welcome to the new blog. I will keep introductions short and get right into the heart of the build. 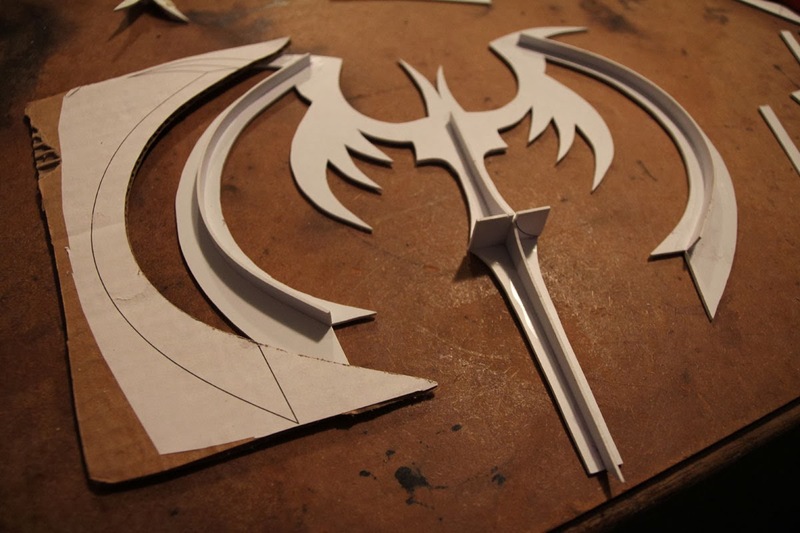 If you are interested in commissioning a prop, please send me an email at prodigalsonindustries@gmail.com On this blog I will outline my prop projects and share what tips and tricks have I picked up along the way. 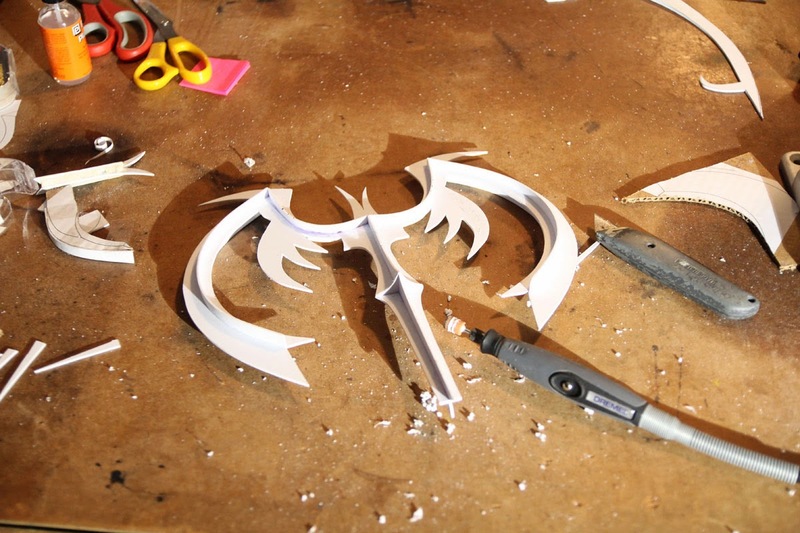 I am a big Kingdom Hearts and Disney fan, for that matter I am also a big stop motion and Tim Burton fan, so receiving a commission for the Pumpkinhead Keyblade was a perfect storm that has made for quite an enjoyable build. I started at square one, where all projects begin, finding reference material. Sometimes I have gotten lucky and have been able to rip the object that I am trying to build from the game asset files. From there I can import the mesh into 3ds Max and get some orthographic renders from which I can make blueprints; however, I was not so lucky with this game. Even with the exciting recent release of Kingdom Hearts 1.5 HD Remix I was no closer to having the file that I needed. Luckily the Keyblade is a relatively flat prop, lacking any really complex detail that I couldn't add in myself in the blueprinting process. I finally settled on this render from Kingdom Hearts Insider and was off and away. 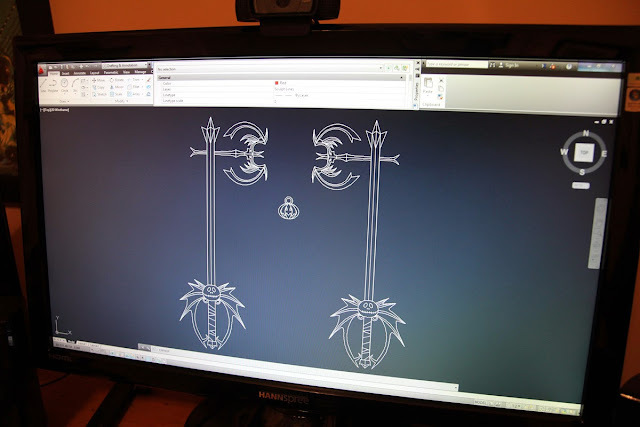 I started where I start every build nowadays, in AutoCAD on my workstation. While the manual I have for the program is the size of a large phone book, I have really grown to enjoy working in AutoCAD. I had to take some artistic liberties with the render, since it is from the non-HD version of the game. 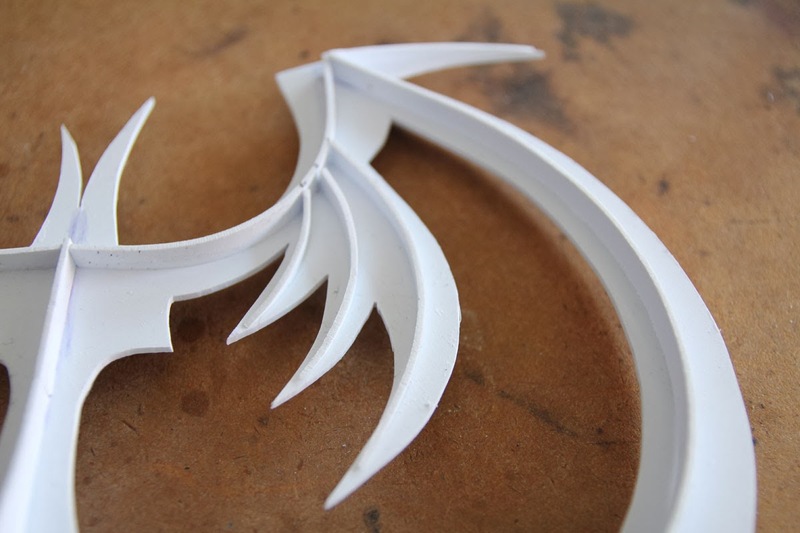 In particular I had to choose how to smooth out the segmented curves of the bat blade, for lack of a better name. 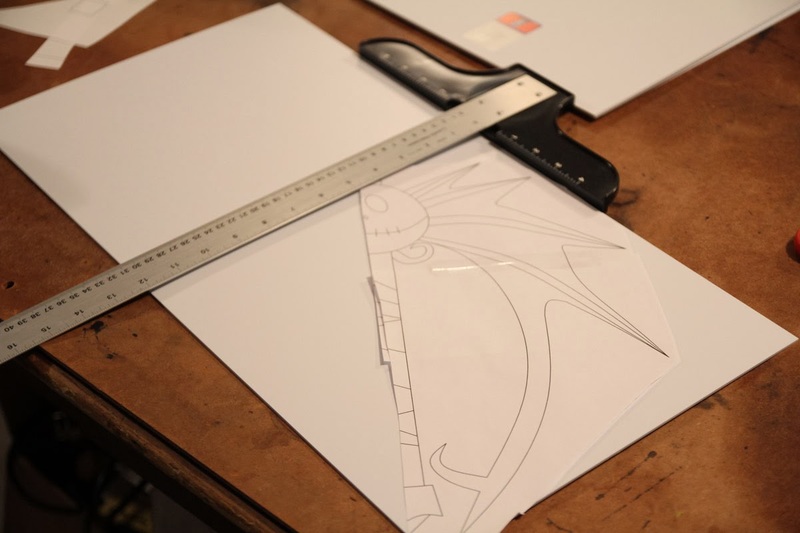 An hour later and the preliminary blueprints were finished. It seems like each project can be broken up into smaller "problems" that need to be solved. 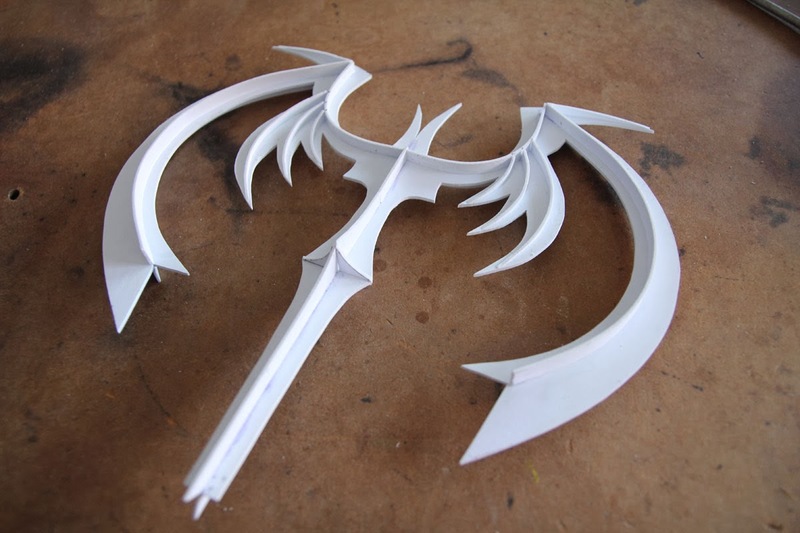 The most pressing of these problems was how to sculpt all of the detail on the bat blade and the cross-guard. 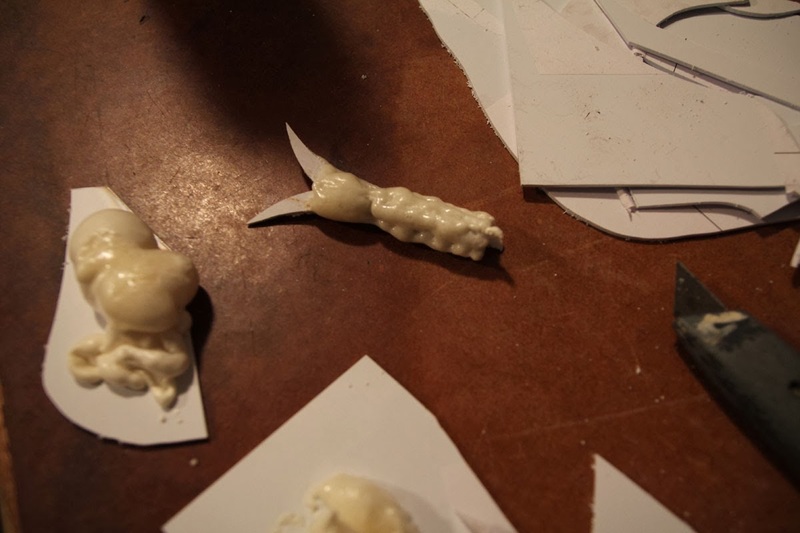 Since I am not a sculptor I had to look for a way to make this process more precise than I could free-hand. 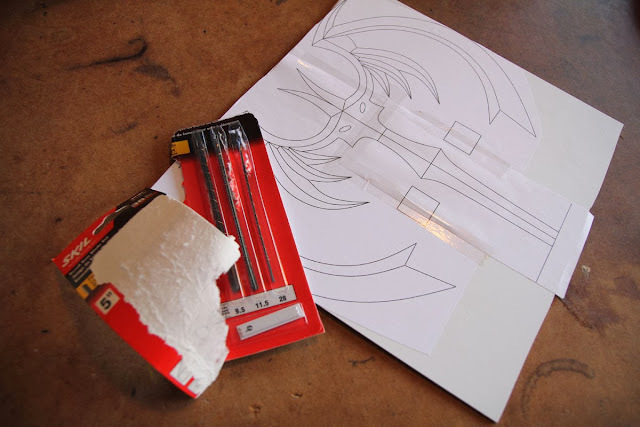 I employed Volpin's Styrene "dam technique" that he used for his Clare's sword build. I started by printing out the patterns to scale to use as cutting templates for the basic outline of the bat blade and cross-guard. These pieces were cut from 0.080" Styrene for rigidity. 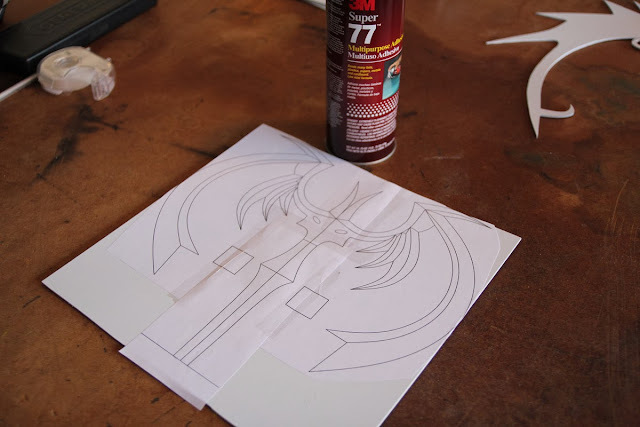 With Super 77 making very quick work of gluing the patterns, I was ready to begin cutting the basic shapes out. 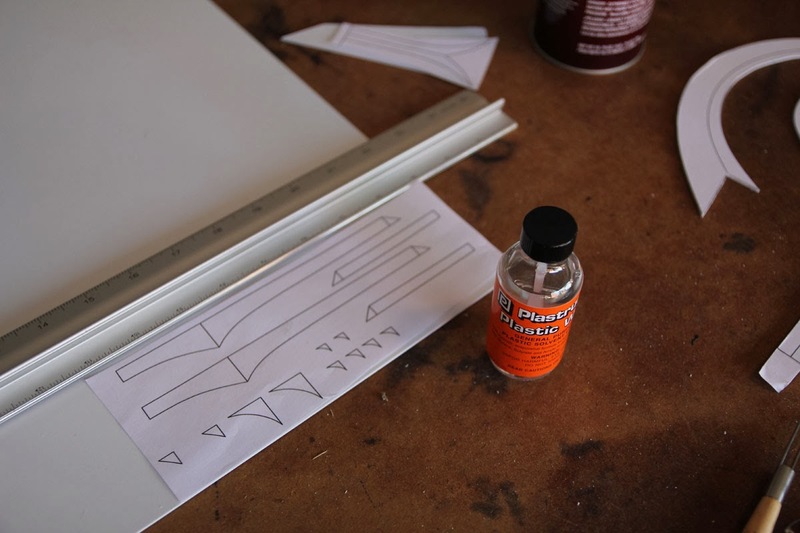 This type of contact adhesive can be great for temporarily attaching templates to work pieces. 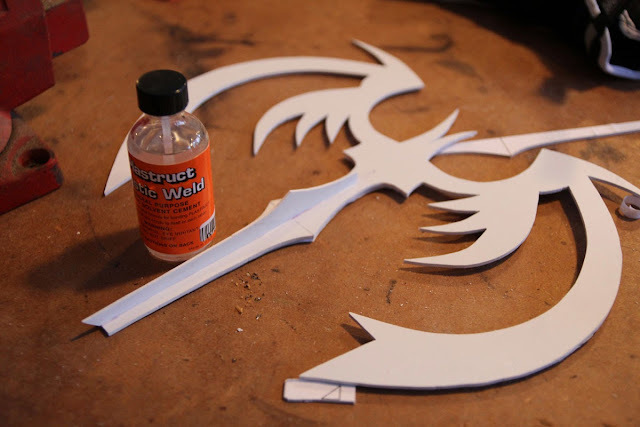 Just make sure to only coat one of the two faces that will be glued, and do not allow the glue time to fully tack-up. 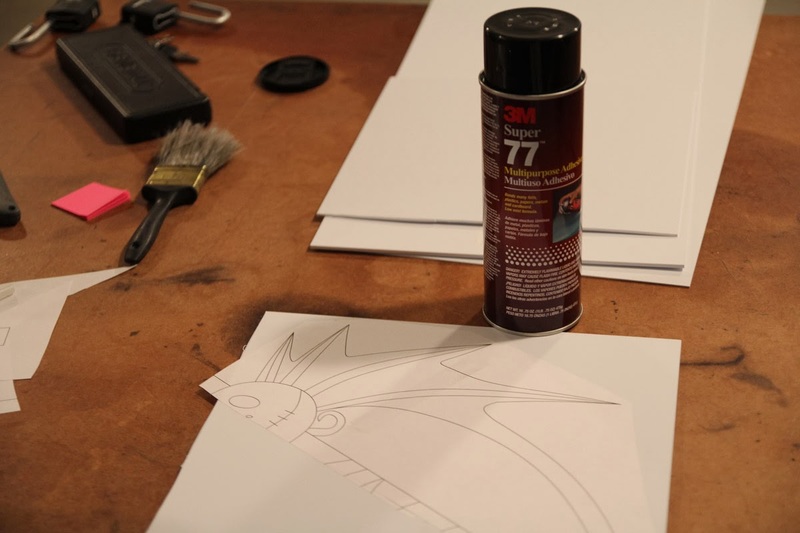 This allows the template to be peeled off later without too much difficulty. 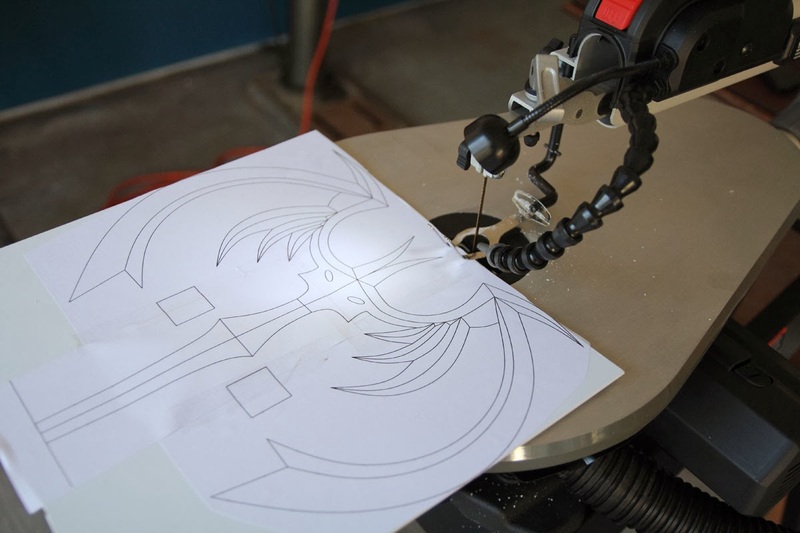 Once glued I turned to my scroll saw to cut out these tight curves and narrow spaces. Here is where I ran into a bit of trouble. 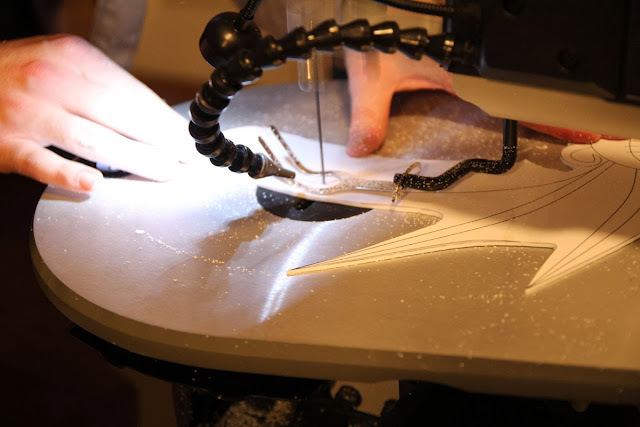 Scroll saws can be temperamental about blade tension, and the blades themselves are not incredibly durable. 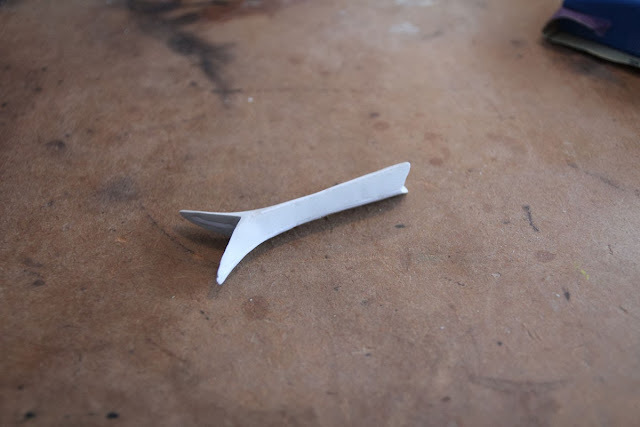 Blades do snap from time to time but are easily replaceable. I realized, much to my horror, after snapping the last of my blades and reaching for my replacement pack that I had accidentally bought the un-pinned type replacement blades when my saw takes only pinned blades. I could have sworn that I had picked up the right type of blades. Oh well, there went an entire night's worth of work. The next day I was able to buy the replacements that I needed (bought a ton extra) and made quick work of the bat blade. 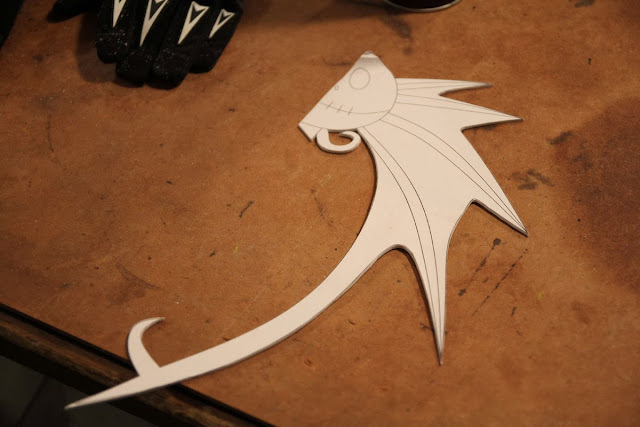 Here is where things started to take some shape. 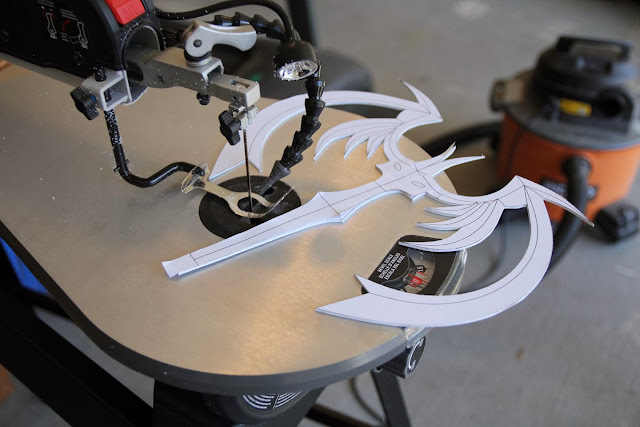 Following Volpin's Styrene dam technique mention above, I started cutting out and gluing the dams into place. I was using a product called Plastruct Plastic Weld. From what I understand this solvent melts the joint that is to be bonded. 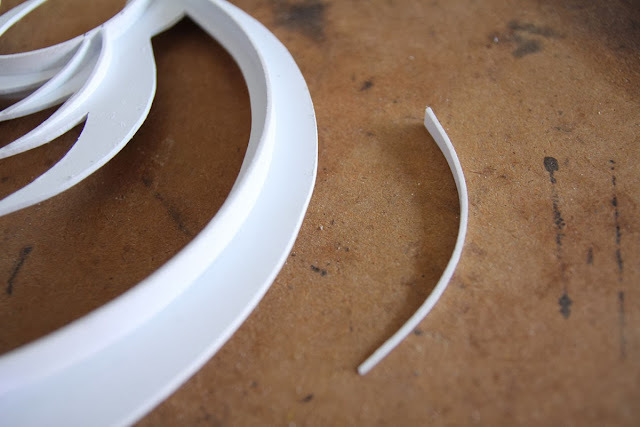 When this melted bit sets the two pieces of plastic essentially become one. A bit more gluing with the straight strips. I found out that the best way to use the plastic solvent is to hold the two pieces to be boned together and to then brush the Plastic Weld onto the joint. Capillary action spreads the solvent and makes for a clean, easy, and strong bond. The curved strips were at first tricky to get set correctly, but this was made easier by cutting out a curve guide from scrap that the strips could be taped to. With them being held in the right shape, it was easy to bond them to the bat blade using the capillary technique. Now all I had to do was to Dremel the protruding dams down and and cut out some styrene triangles for the finer details. Here you can see one of the detail strips. 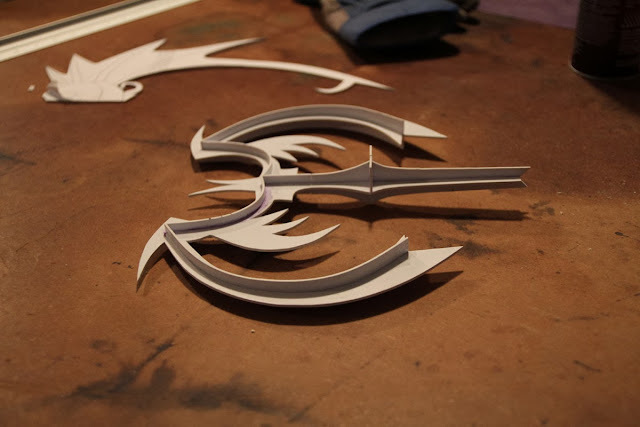 At first I was having a difficult time gluing them in place as they were too small to tape them to a scrap curve guide. As is usually the case the obvious answer was staring me in the face. I found out that I could simply bend the strips into the curve that I needed and they would hold their shape! Now I started filling in the dams with Apoxie Sculpt. 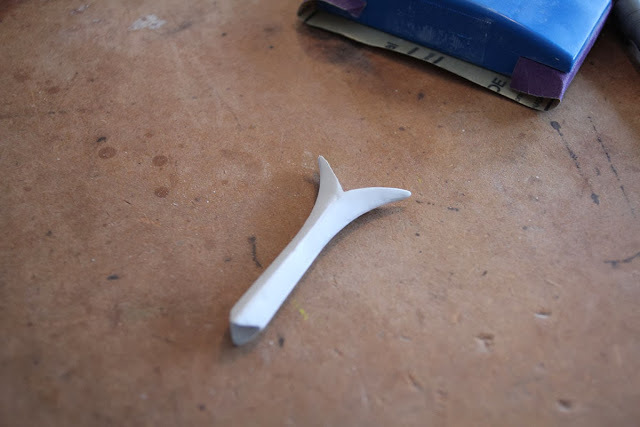 Since this was a new process for me I started by filling the tail section of the bat blade as a test. In an effort to not waste the modeling compound I decided to try to fill up the void with some expanding foam. This stuff was a bit messier that I anticipated, I was glad I did this on a test piece. 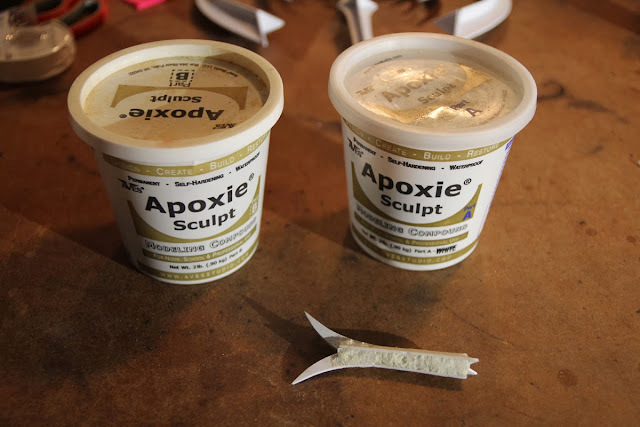 After quite a bit of clean up, the piece was ready to be skimmed with the Apoxie Sculpt. 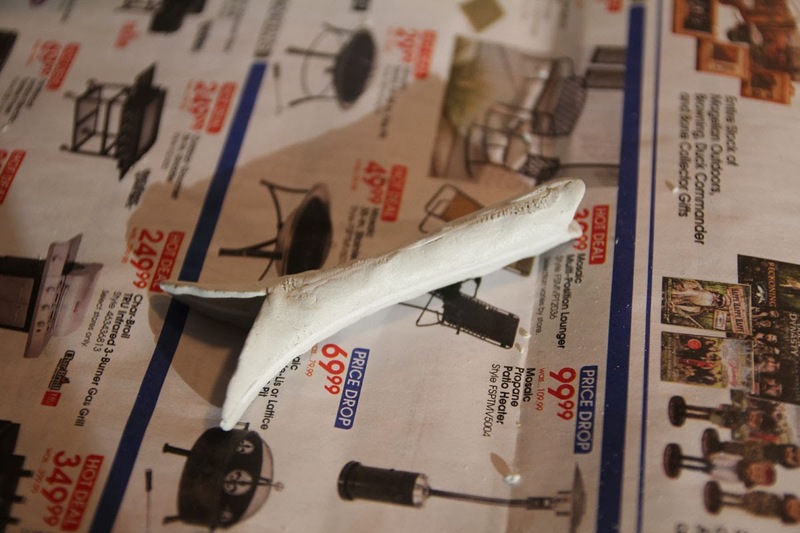 After the rough coat dried, I sanded it down to a smooth finish. 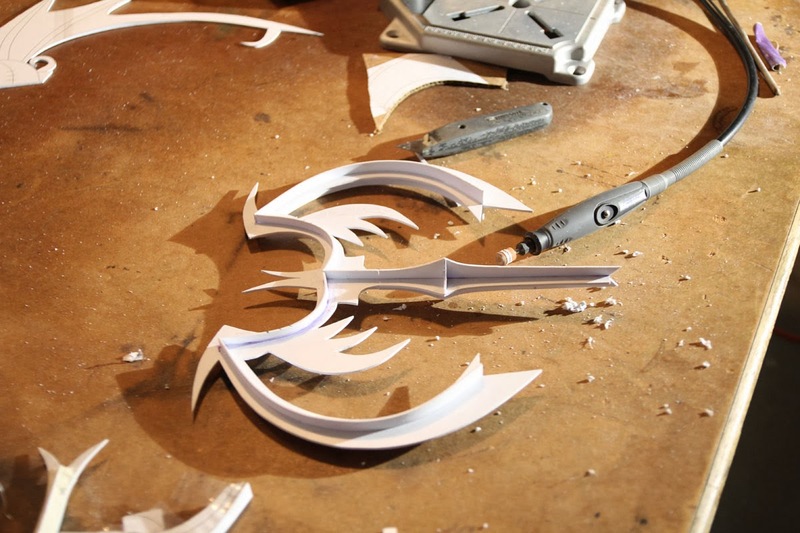 The piece still has a few rough spots, but I will fix all of those once the rest of the Keyblade's parts are sculpted and sanded. Thanks for following along, and keep an eye out for the rest of this project in Part II. Thank you very much! The work on your blog is top notch!